Organic Star Ruby grapefruit. We’ve selected this variety for its dark pink flesh and fantastic flavour. It’s a very juicy variety – ideal if you like to squeeze your own juice for breakfast. Really high in vitamin C, colourful and zesty – a brilliant fresh fruit to add to your plate. Best stored in a cool room or the bottom shelf of a fridge. 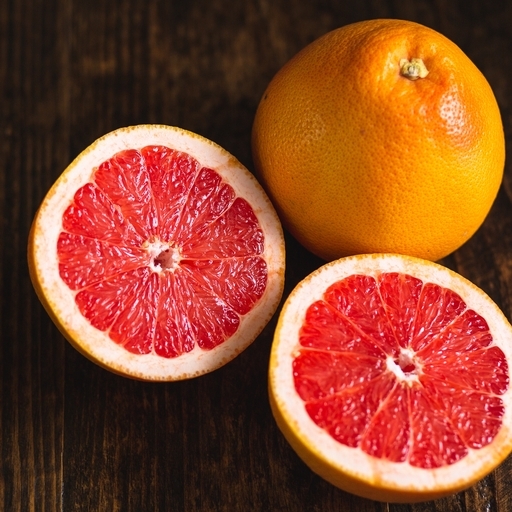 Like lemons, grapefruits cannot be ripened once picked. The variety we sell is Star Ruby available all year round from Spain, Sicily and South Africa. Our grapefruits are sold as class 2. This means that they might not look cosmetically perfect, but they are grown for the very best flavour. (We have to tell you this to satisfy some EU rules).